FRANK TUSA has been active as a professional musician,composer and educator for over 30 years. He has written original music for dance, film,TV and commerical radio. 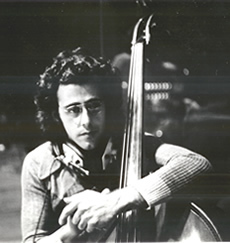 Frank studied classical bass with Homer Mensch, music theory and composition at Brooklyn Academy of Music. He spent the next twenty years in New York continuing his studies and working through the ranks as a performer, educator, composer and arranger. He developed a passion for jazz and began performing and recording with many of the great jazz legends including Stan Getz, Buddy Montgomery, Benny Carter, Billy Mitchell,Don Cherry, Art Blakey, Chet Baker, Joe Henderson, Larry Coryell, Shelly Manne, Herb Ellis, Barney Kessel, Joe Williams, the Hi-Lo's vocal group and many other Jazz Artists. Frank was a key contributor to “Young Audience Concerts” doing clinician work for the New York City School District. This included teaching the basic elements and skills of music, how to listen and how to express your ideas through improvisation. Frank Tusa was one of the original members of Dave Liebman’s critically acclaimed group “Lookout Farm”. He co-authored Lookout Farm: A Case Study of Small Group Improvisation, Almo Publications. He has also been the recipient of a National Endowment of the Arts Fellowship Grant. Currently Frank has been devoting his time to writing original music, performing with his trio's, quartet and quintet and his favorite tabla player Badal Roy. He has been involved in a children's music and movement program which started with his late wife Valerie Mabel Tusa called "Whippersnappers". The program is a hybrid that encompasses the best and most effective methodologies drawing from Dalcroze, Orff, Kodaly and Suzuki and has been very well received. Most recently Frank has written a tone poem for his niece who was born with Cerebral Palsy, the idea is based on: "If You Use Your Imagination You Can Go Anywhere With The Power Of Your Mind".